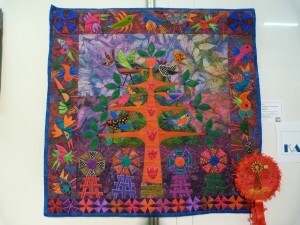 In the quilt show at Quilt Festival, there was a category for 3-D quilts. There were only a small number of entries, but all three that I found were incredibly creative and inspiring so I thought I’d share them with you. 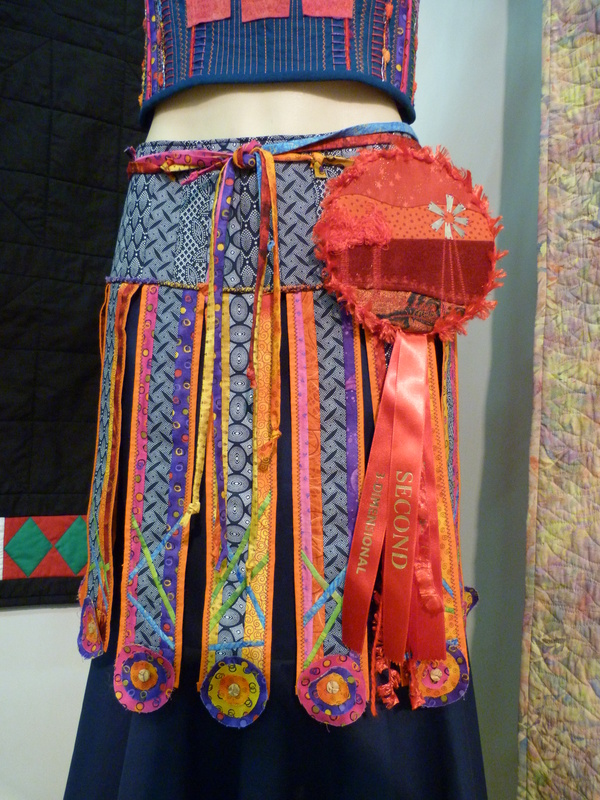 On my initial run through the quilt show during the lunch break, I missed the first place winner. The next time I went, a docent offered to open it up and show it to me. It stood on a table and was heart-shaped. 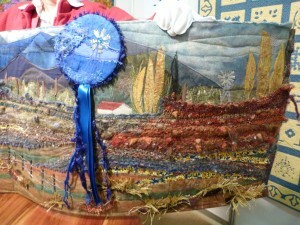 When the docent opened it, a colorful farmland scene with a windmill was revealed. 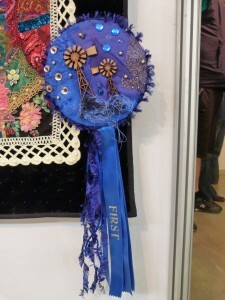 “In my hart woon ‘n plaas” was made by Trienie Krugel using a variety of techniques combining knitting (she cut up an old sweater), needle felting, machine piecing and applique of cottons and silk as well as embellishments in thread and “found objects”. 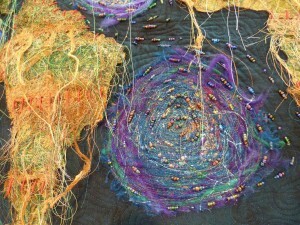 Check out these detailed pictures of this amazing piece. The second place winner was an original outfit, “Shine Radiant Woman” by Brenda Dickeos, which included a skirt and top accessorized with a hat and necklace. 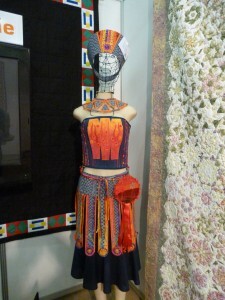 Her hat and necklace designs were inspired by African fashion. The colors are wonderfully vibrant, the brights being nicely complemented by the traditional indigo Shwe Shwe fabrics. Embellishments of needle felting on painted batting, machine made cords, hand embroidery and hand and machine quilting all enhance the ensemble. You can see some of this on the detailed pictures. The other entry I found was such fun – a whimsical bird that made me smile. “Koonap Koekie” was made by Macky Cilliers, who wrote, “As yet not documented in any bird book. 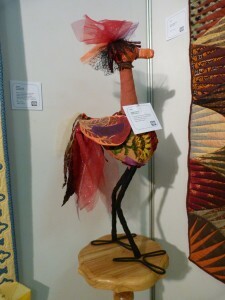 This bird resides among the reeds on the banks of the Koonap River.” Mackie is a well known creative quilting teacher in South Africa and teaches some unusual techniques including corn plaster embroidery. 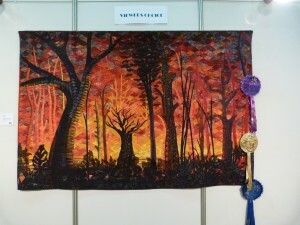 The most popular quilt with the viewers at the quilt show was “Bush Fire”, 185 cm x 123 cm, by Tilly de Harde, which received the Viewers Choice award. It was easy to see why. 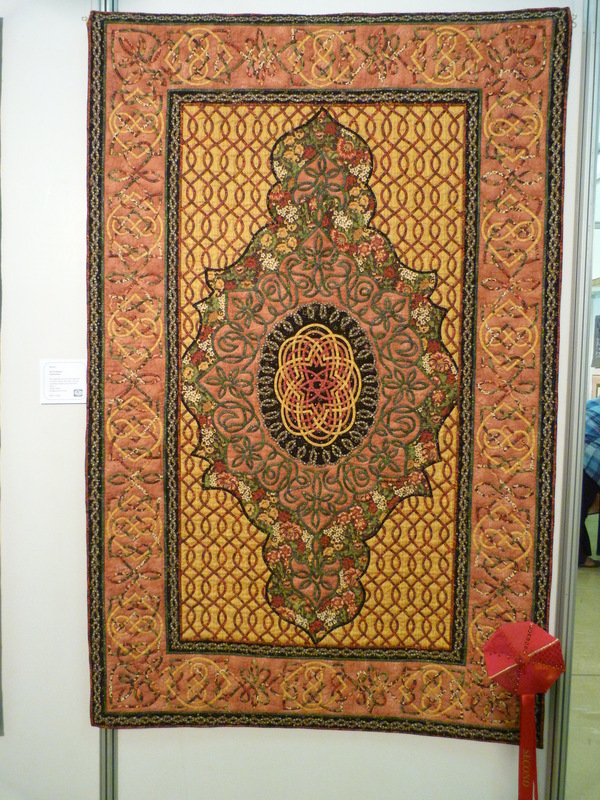 This quilt is an extraordinary work of art, displaying a design with a powerful impact and incorporating many quilting techniques. 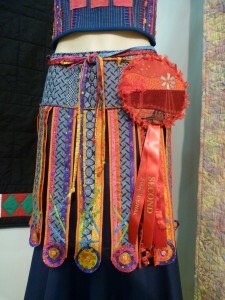 The quilt won first place in the “Free Style” category which encompassed a large variety of quilts. Here’s what the label said: “Silhouette of trees and plants against a backdrop of fire. A Round Robin with a difference; monthly instruction from Mayflowers over a period of a year. 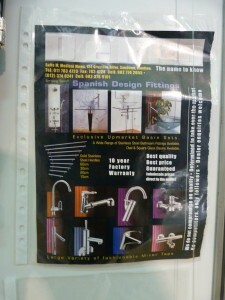 Design credit: inspired by the work of Gloria Loughman.” Check out these detailed pictures. 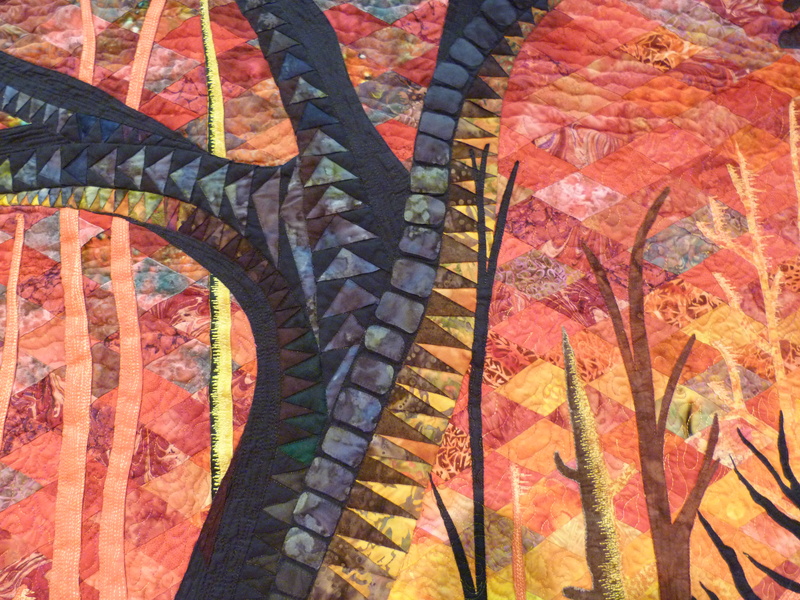 I love the way Tilly pieced traditional quilt patterns into the tree trunks and branches. Look at the wonderful background which is pieced from diamonds in many shades of red, orange and yellow. There is also thread painting to add detail to the shading on the trees and the veins on the leaves. 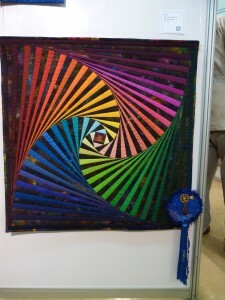 This was a well deserved winning quilt. 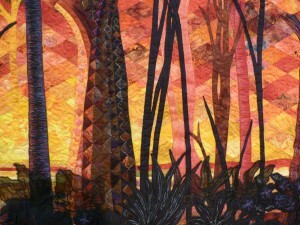 Tilly entered another stunning quilt into the “Free Style” category. I was surprised this one didn’t receive an award, but the competition was steep and the judges had a difficult job. “In Tatters”, 150 cm x 102 cm, illustrates the world in tatters and is a protest about the way humans are destroying the earth. The foundation of the quilt is the earth as it should be and the embellishments symbolize the destruction taking place. 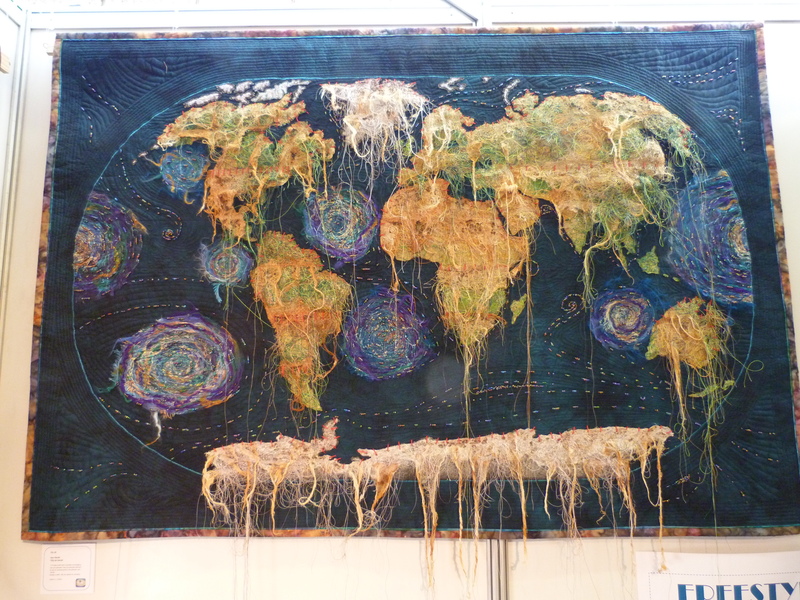 The straggly tatters are made from bandages that were dyed using rust and the red stitches visible on the detailed picture of South America are for the blood that has been shed. In the embellished oceans there are plastic bottles and garbage. The quilt makes a powerful statement which is hard for some of us to stomach. Once again, Tilly’s workmanship is amazing, and this is a fantastic quilt. Tilly also made “Senseless”, a quilt protesting the senseless killing of rhinoceros for their horns, featured in my Festival blog #3 about the challenge quilts. She is a talented artist and I’m in awe of her work. 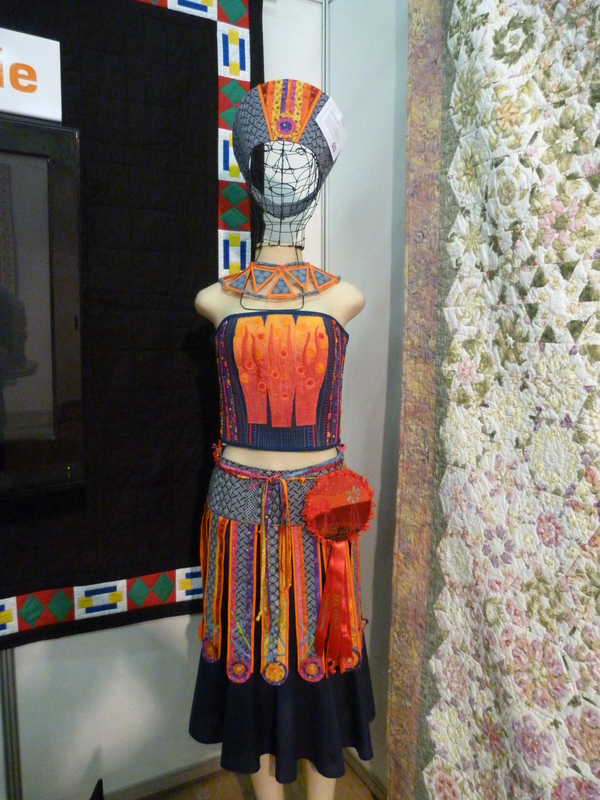 My blogs on the quilt show at the South African Quilt Festival in Bloemfontein would not be complete without sharing the exquisite Celtic applique that was displayed. 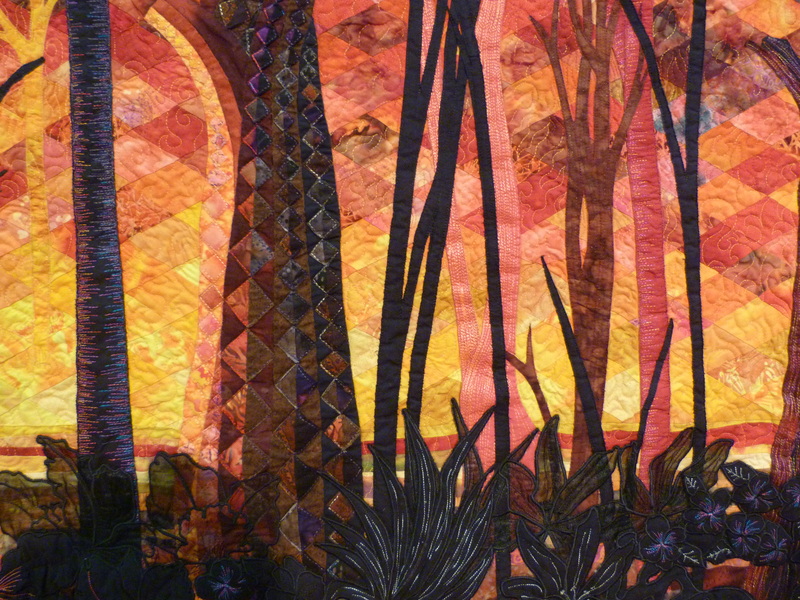 Sue Prins, well known quilting teacher and judge, designs amazingly complex patterns and inspires her students to make beautiful quilts. 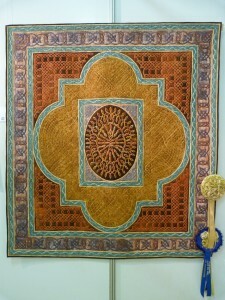 The Best of Show quilt, Marakesj, 130 cm x 145 cm, was designed by Sue and superbly executed by Suzette Ehlers. 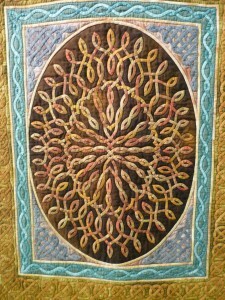 This stunning quilt was hand appliqued and hand quilted. 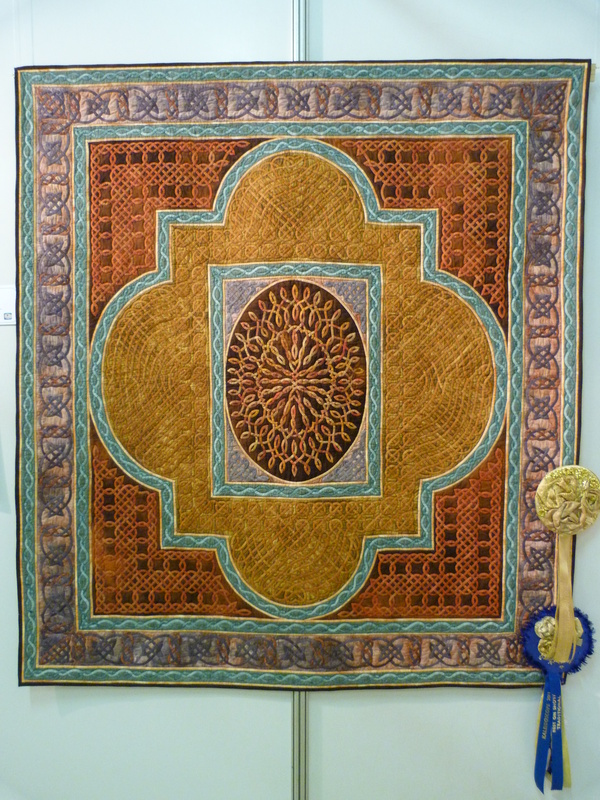 Suzette made another quilt Celtic Persian, 98 cm x 153 cm, which received a second place award in the traditional category. 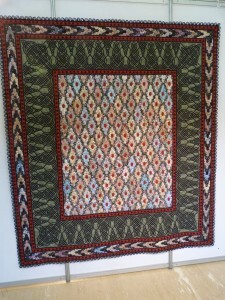 This one was also designed by Sue and the inspiration came from the pattern on a Turkish carpet. 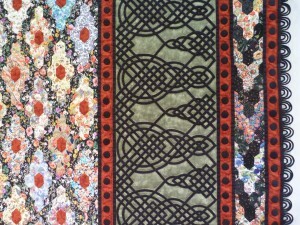 The colors were all drawn from the main floral fabric. 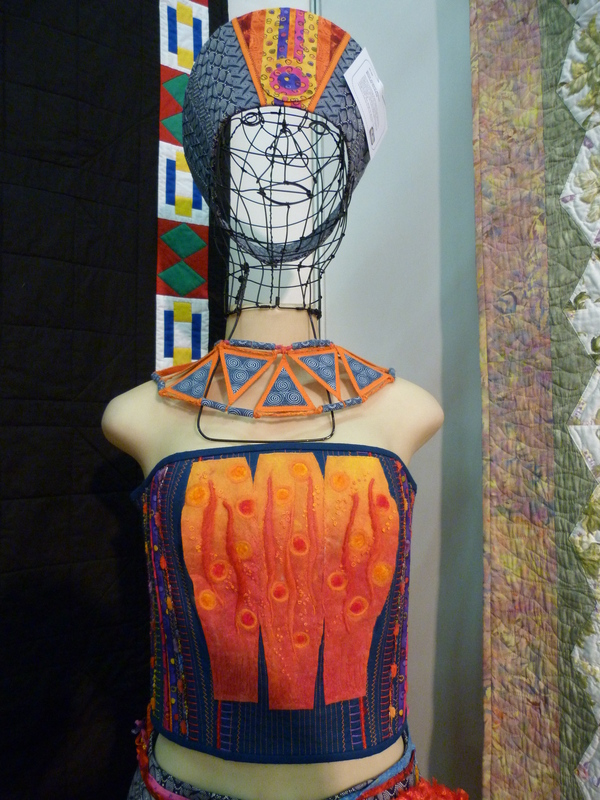 I was excited to see one of Sue Prins’ quilts displayed in the non-judged part of the show. This amazing hand pieced and appliqued bed-sized quilt is a rich combination of English paper-pieced elongated hexagons from fine lawn Liberty of London fabrics, and Celtic work. The detail is incredible and I love the loops around the edge. 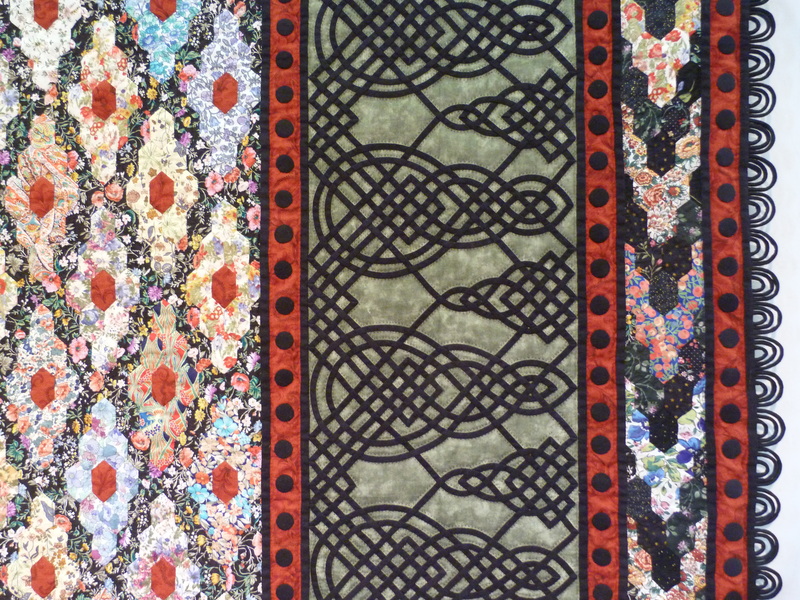 Sue’s hand-quilting is also outstanding. 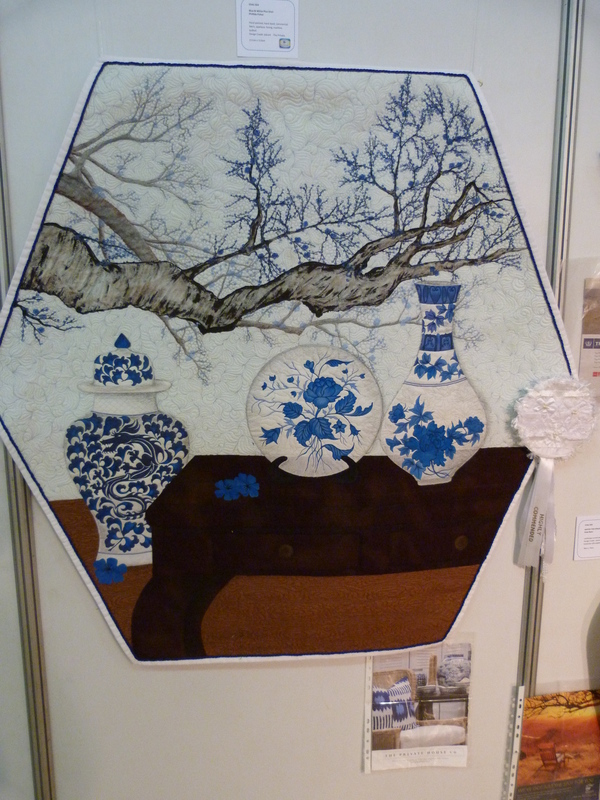 The quilt show at Quilt Festival included a challenge which I thought was very clever and the quilts were extremely creative. 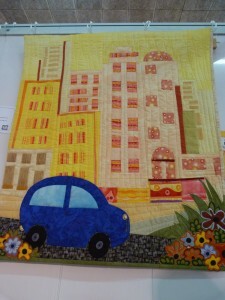 The challenge was to make a quilt inspired by an advertisement. 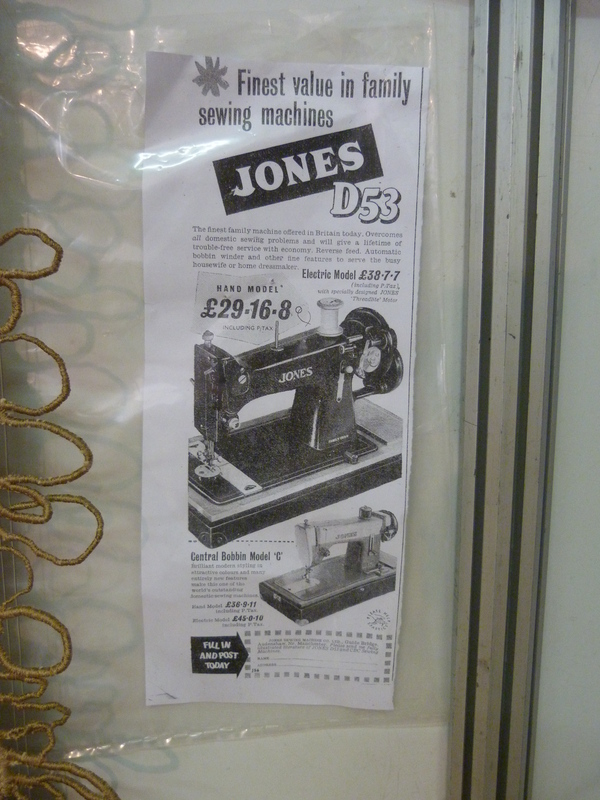 The quilters could choose any advert they wanted and the adverts were displayed with the quilts. 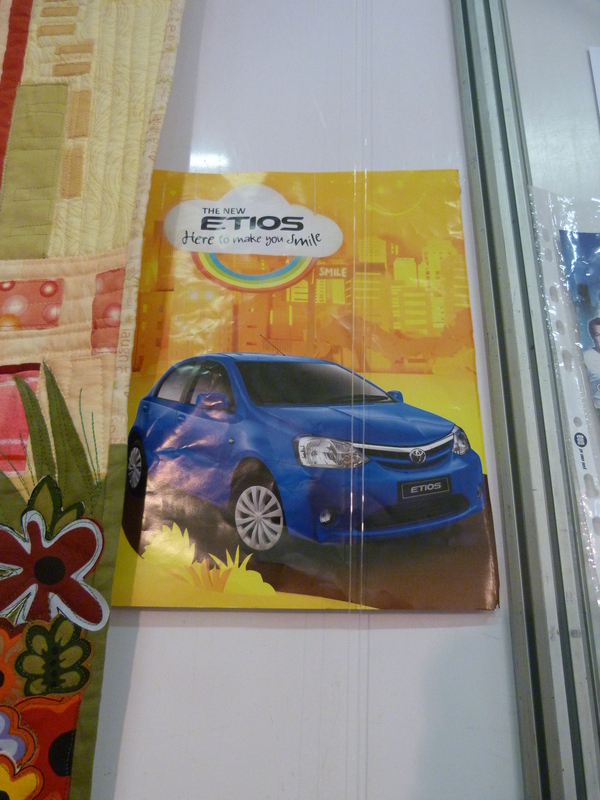 Here’s a sampling of these wonderful quilts and the accompanying adverts that provided the inspiration. What fun! “My Little Blue Car” by Nicky Hunter Smith, (65 cm x 75 cm), inspired by an advert in a car magazine. The first place winning quilt was this lovely antique sewing machine, “Vintage Sewing” made by Marianne le Roux (62 cm x 68 cm). 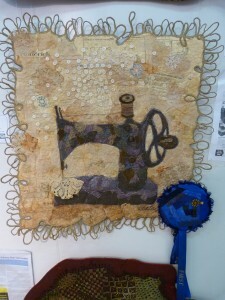 Marianne used all kinds of vintage fabrics, lace and buttons on her quilt to create a wonderful collage with free-motion stitching holding it all in place. 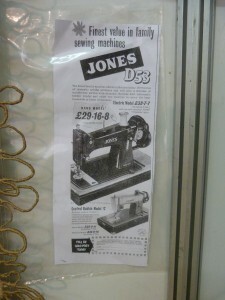 Inspiration came from not only the advert and vintage materials, but also from quilting teacher, Catherine Hammer Fox. 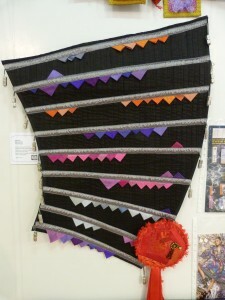 Trienie Krugel, the second place winner, made “Renovation”, (58 cm x 72 cm) using black silk strips machine stitched onto the background to represent towel rails. 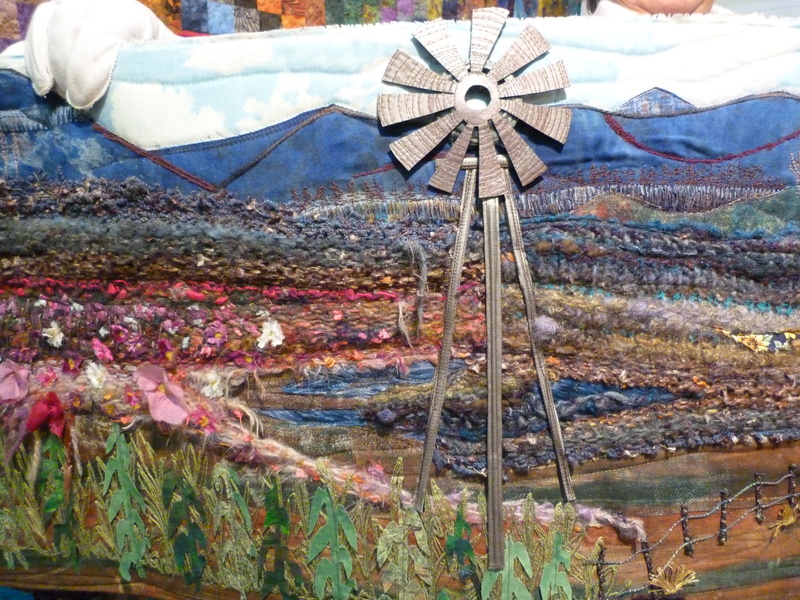 I like the interesting shape of this quilt, mimicking the image in the advert and the introduction of the colored Prairie Points that match the background colors of the different taps. 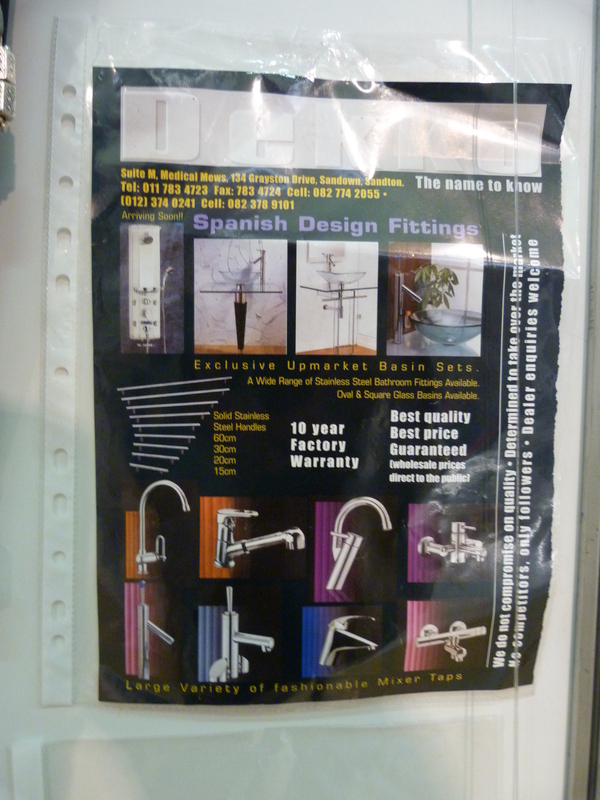 The advert came from South African Homeowner Vol 4.4, July/August 2003. “Blue & White Plus One!”, made by Phillida Fisher, (111 cm x 113 cm) was inspired by an advert from The Private and received highly commended. 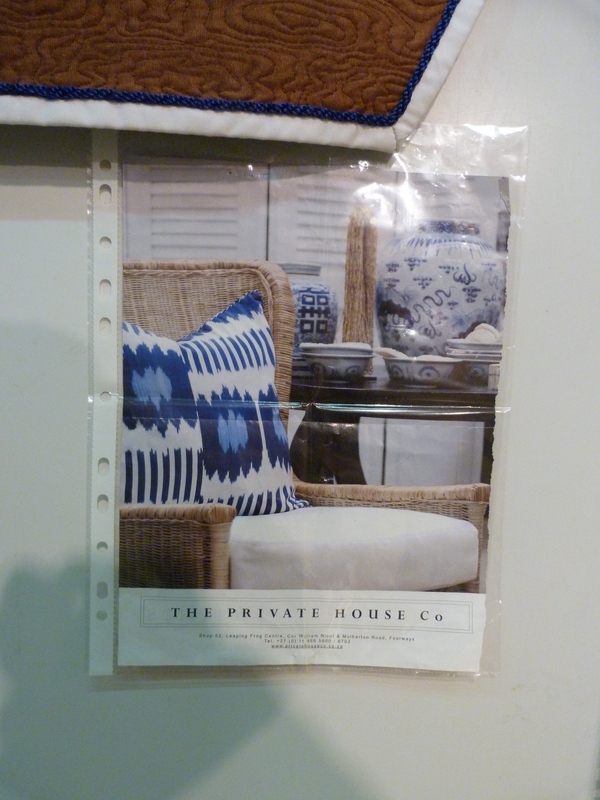 A variety of techniques including hand painting, hand dying, and applique were used to make this attractive blue and white piece. 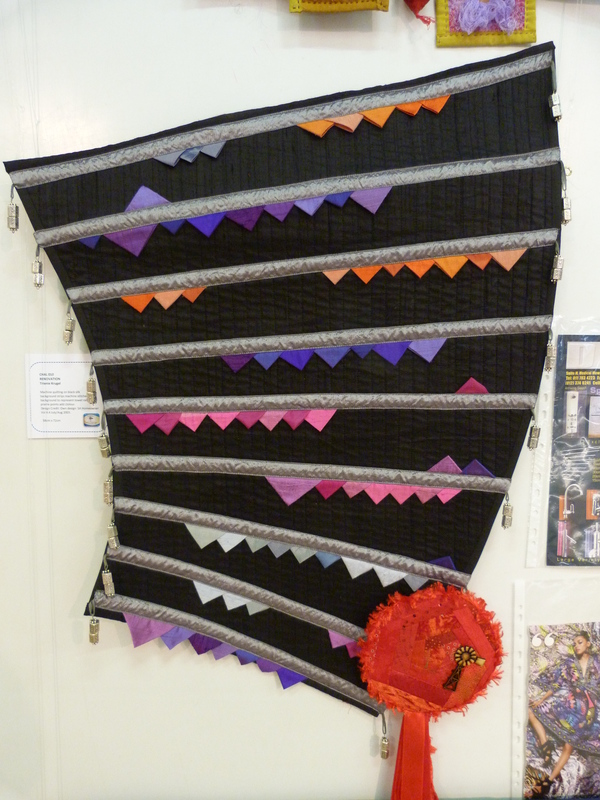 I was intrigued by this amazing metallic-looking quilt, “Senseless” by Tilly de Harde, (62 cm x 78 cm). 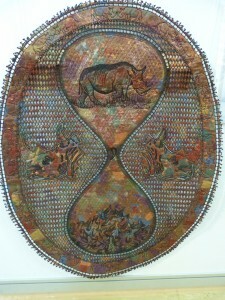 This is a protest quilt depicting the senseless killing and dwindling numbers of rhino. The advert from Birding Magazine, shows an hourglass with a tree dropping through and gathering in the bottom as a pile of sticks. 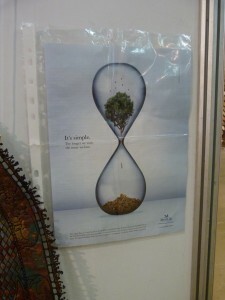 It says, “It’s simple. The longer we wait, The more we lose.” As Tillie’s rhinos drop through the hourglass, they are reduced to a heap of rhino horns. Tillie used fuse and burn techniques to create the holes and burnt fringes around the edges. The machine quilting details of the rhinos are amazing. 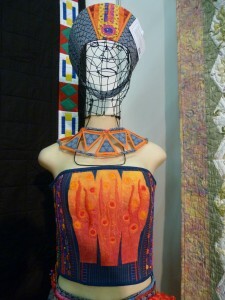 These quilts were truly inspiring. Participating in a challenge is a great way to encourage creativity and experiment using new and unusual techniques. 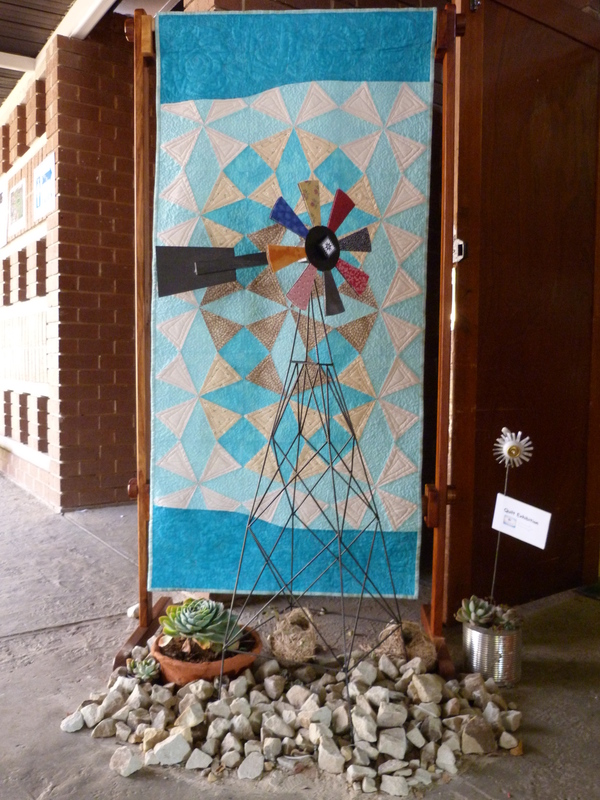 As I mentioned in my last blog, the theme of the Quilt Festival in Bloemfontein was Kaleidoscope, and the wild-pump image was used as recurring motif to represent this. 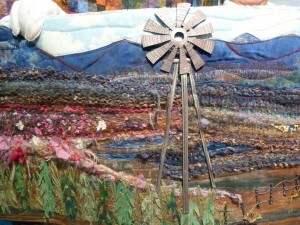 In the entrance way to the quilt show there was a beautiful quilt with blocks of farmland scenes. There was no label attached, but I think it was made by a member of the host guild, the Oranje Kwiltersgilde. 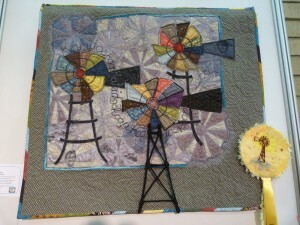 Here’s a detailed photo of the lovely wind-pump. Also, check out the beautiful hand-made awards ribbon with the windmills. The quilt show was spectacular and over the next few blogs I’ll be posting more quilt pictures. 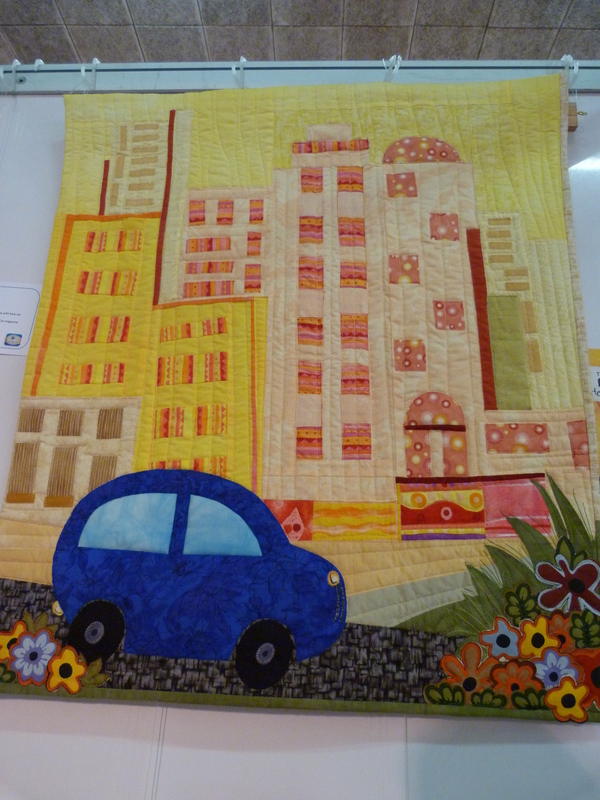 Some of the quilters asked me, “How does our quilt show compare to the national level quilt shows in the USA?” I responded that while the show was on a smaller scale, the quilts were of a high standard and many would do well at the national or international level. I was very impressed. There were so many vibrant and inspiring quilts with plenty of color. 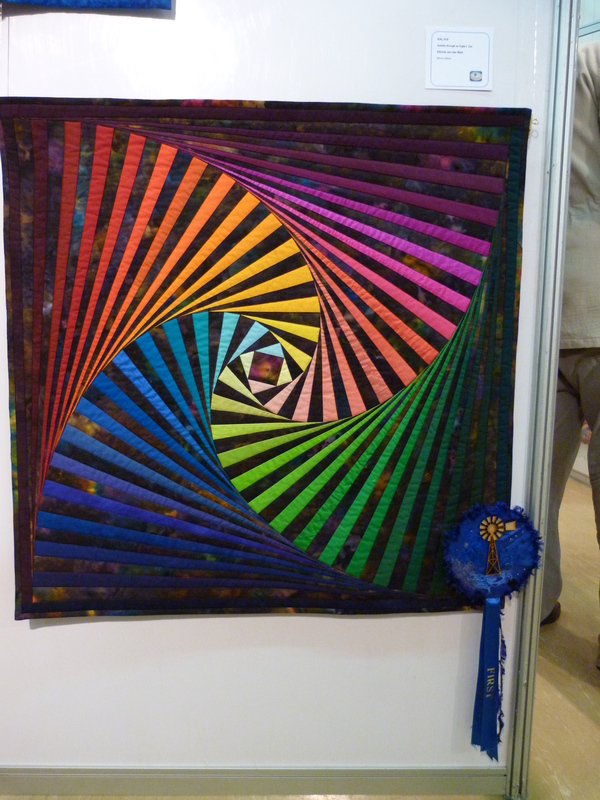 Here are the award winners in the Kaleidoscope theme category. 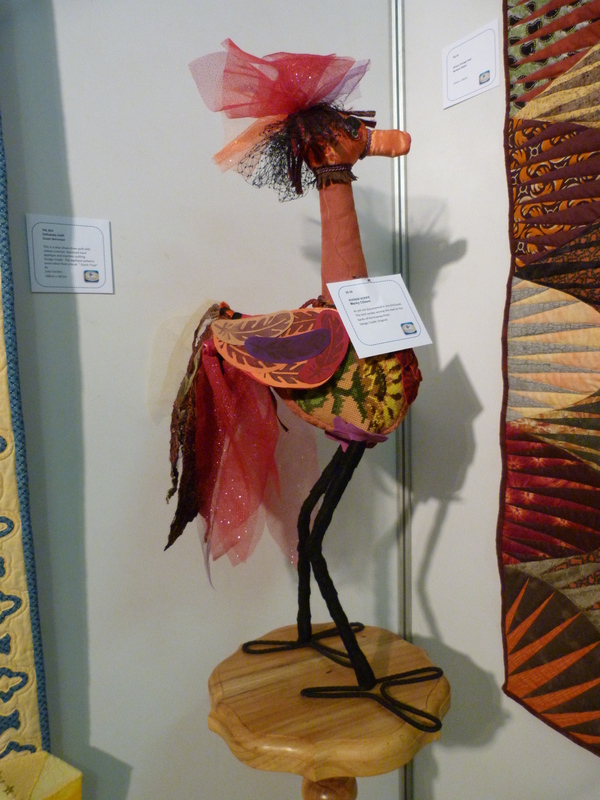 On the left we have the third place winner, “Kaleidoskoop” (74 cm x 67 cm), by Iessie Steenberg (Quilt Festival Chair). Iessie was inspired when she took a class from Kathryn Hamer Fox. 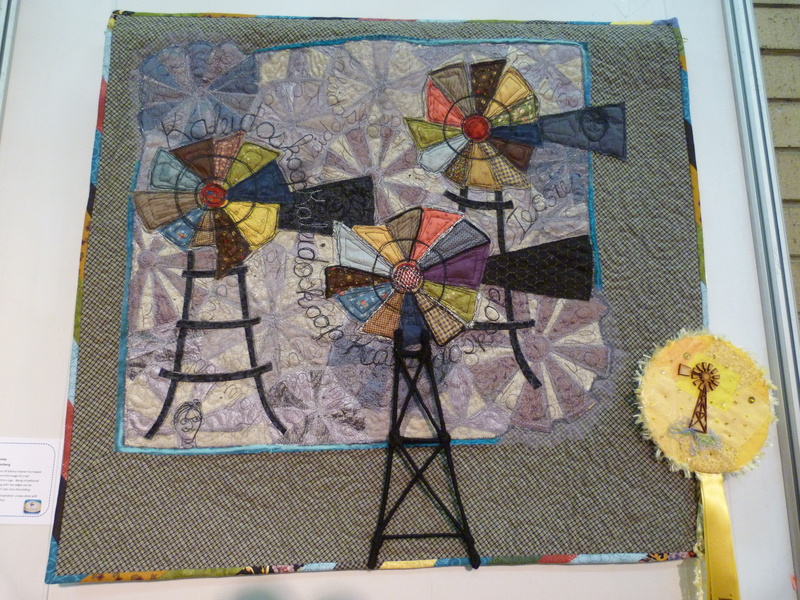 Iessie writes, “Kathryn helped me transform the real image of a “windpomp” into a logo. 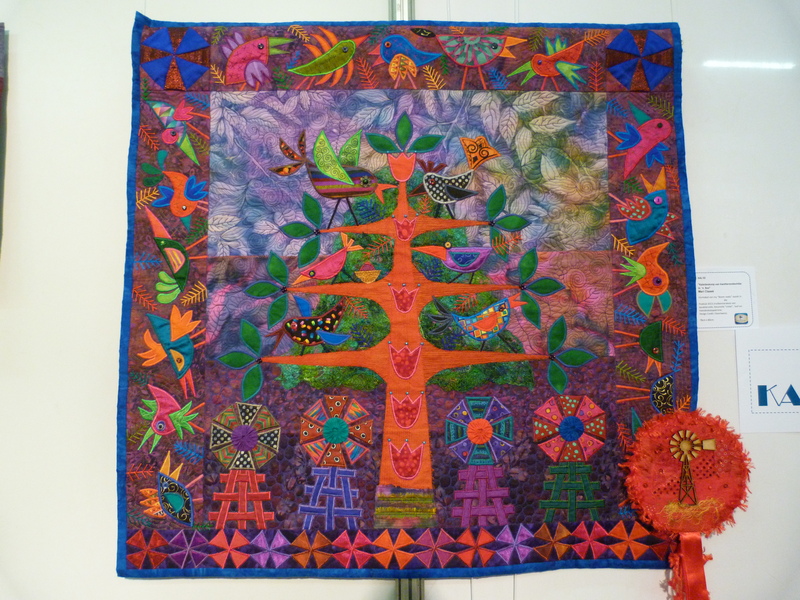 Being a traditional quilter, working with raw edges can be challenging BUT also very stimulating.” The second place winner has a lovely tree of life with a variety of birds and wonderful windmills as well as Kaleidoscope blocks. 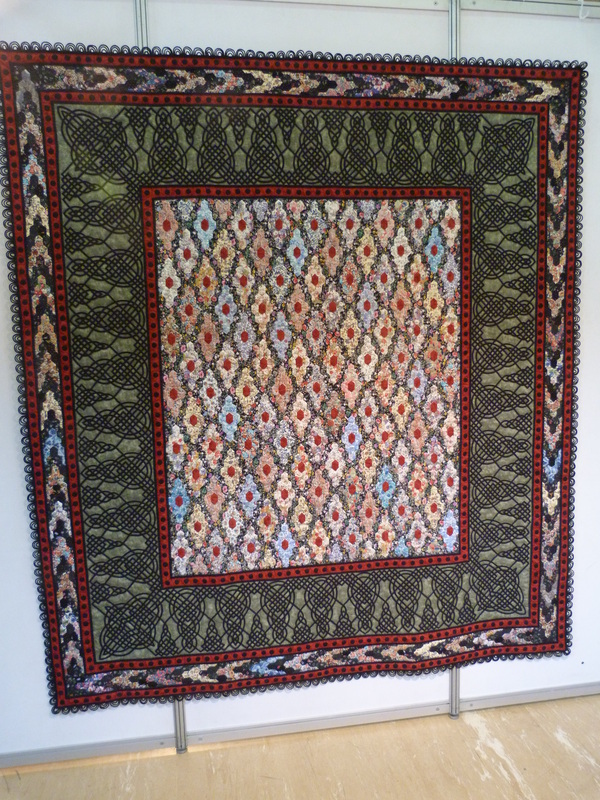 It’s called “Kaleidoskoop van kwetterendevinke ‘n Bos” (78 cm x 80 cm), by Mari Claase. 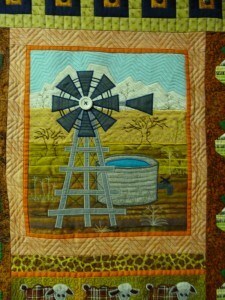 Unfortunately, I can’t read the Afrikaans that she wrote about this quilt, but I thought you would enjoy the photo of it. The first place quilt was colorful twisted Log Cabin. 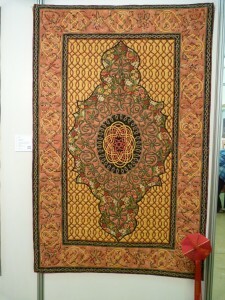 The photo really doesn’t do this quilt justice, Some of the colored pieces were silk and just glowed. It was a magnificent piece entitled “Kaleido through an Eagle’s Eye” (80 cm x 80 cm), by Elmine van de Walt. It was fun having Elmine as a student in my Op-Art Kaleidoscope class. 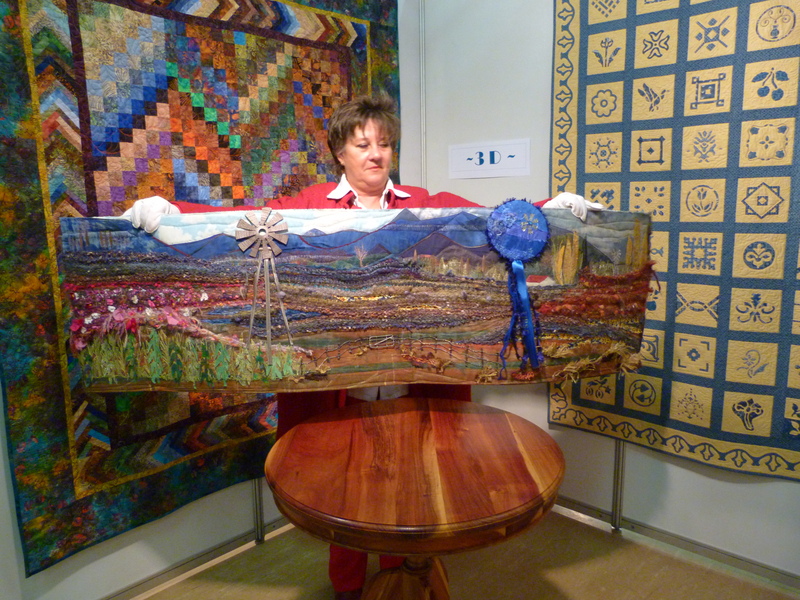 I’ve just returned home after a wonderful month in South Africa, beginning with the 17th National South African Quilt Festival in Bloemfontein. 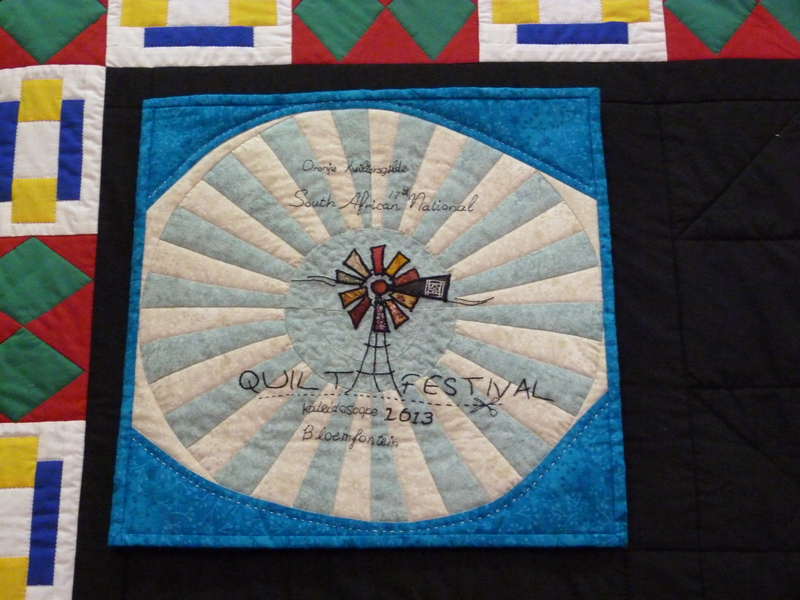 I’ll be writing several blogs about the Festival, where I taught for all six days, made many new quilting friends and enjoyed the outstanding hospitality of the Oranje Kwiltersgilde. 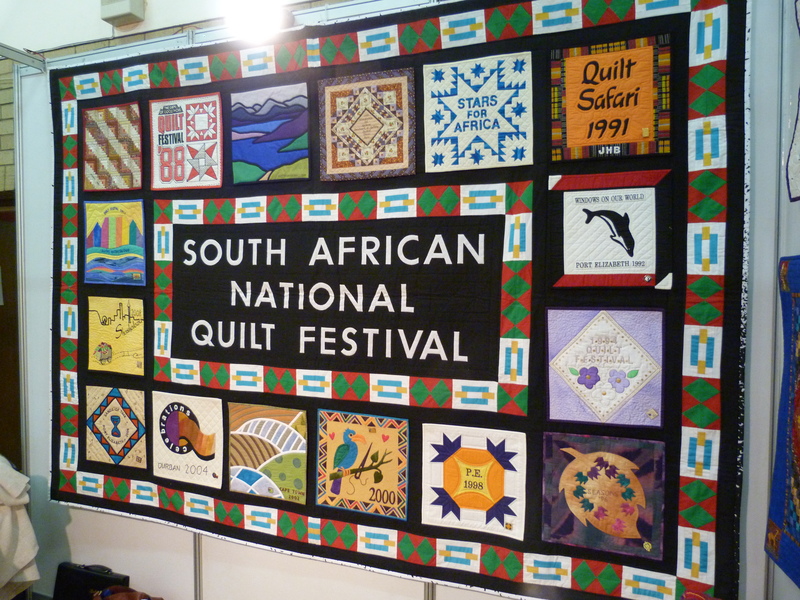 The South African Quilters’ Guild hold these Festivals every other year. 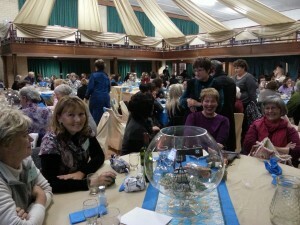 The location rotates around the country and the event is hosted by the local guilds in the area. Bloemfontein is fairly centrally located in the country, in the Free State about four and a half hours drive southwest of Johannesburg. Festival was held at Eunice High School, while the high school kids were on their winter break and accommodation was at their hostel. I was given a VIP apartment, (rather than the dormitory), with my own little kitchen and bathroom which was very nice. The beautiful banner has panels from all 16 of the previous locations of the Quilt Festival. Bloemfontein is the 17th Festival so is the first one on a second banner. 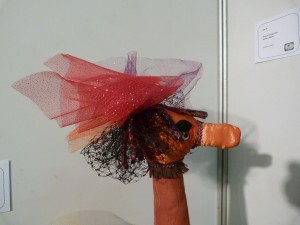 The theme of the Festival was Kaleidoscope. 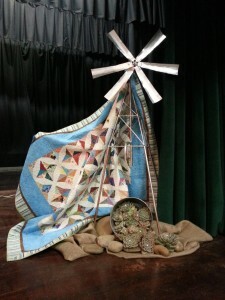 They used the motif of a windmill to represent this and decorated beautifully with windmills and Kaleidoscope quilts. This area is farmland and these windmills are all over the place, pumping water for the animals, so it was the perfect theme choice. 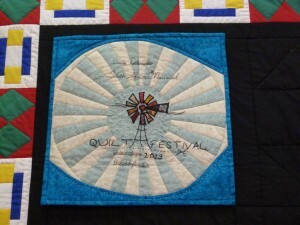 At Quilt Festival there were over 20 teachers and as many as 15 workshops running simultaneously on each of the six days. Some teachers just taught one or two classes and others, like me, had a busier schedule. 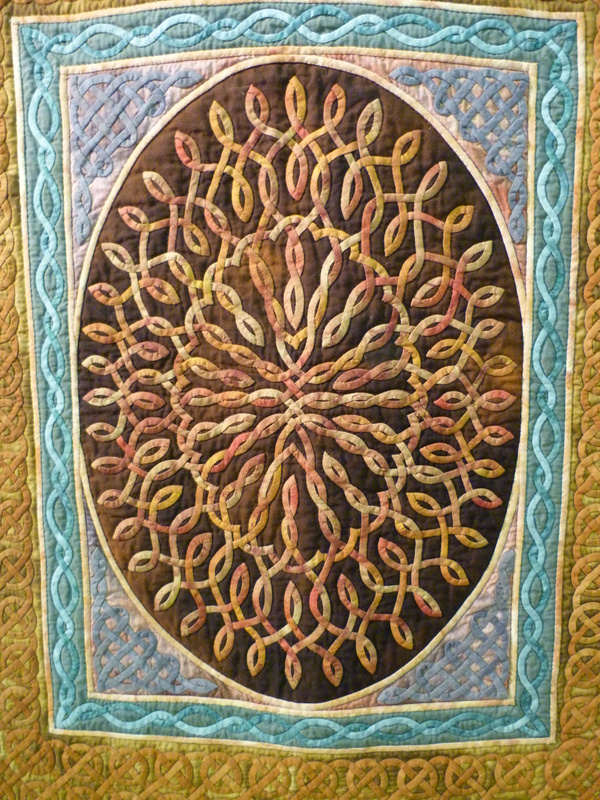 In addition to the classes, there were lectures during the lunch break, (I did two), a wonderful quilt show and a good variety of vendors. We also had three evening events – a welcome dinner where the teachers were introduced, an awards dinner to celebrate the winning quilts in the show and a wrap-up farewell dinner. 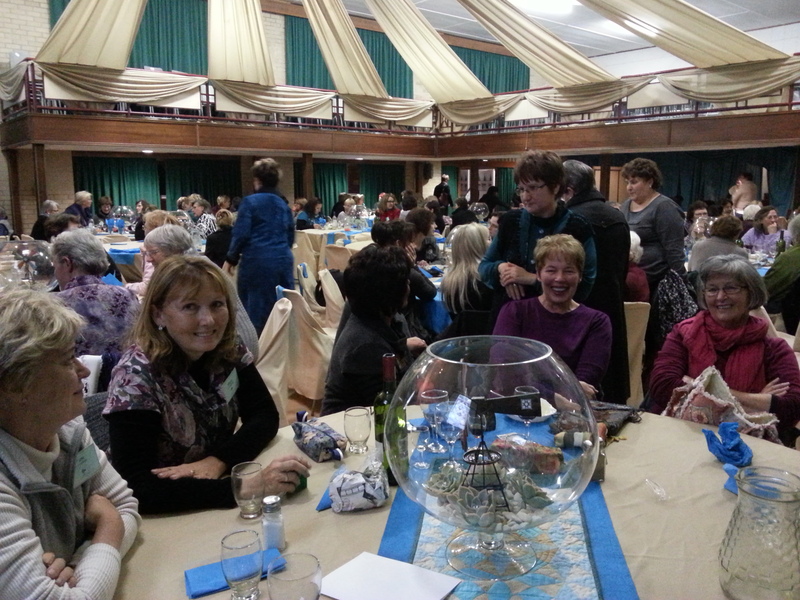 Each was catered beautifully and the traditional Afrikaans food was outstanding. 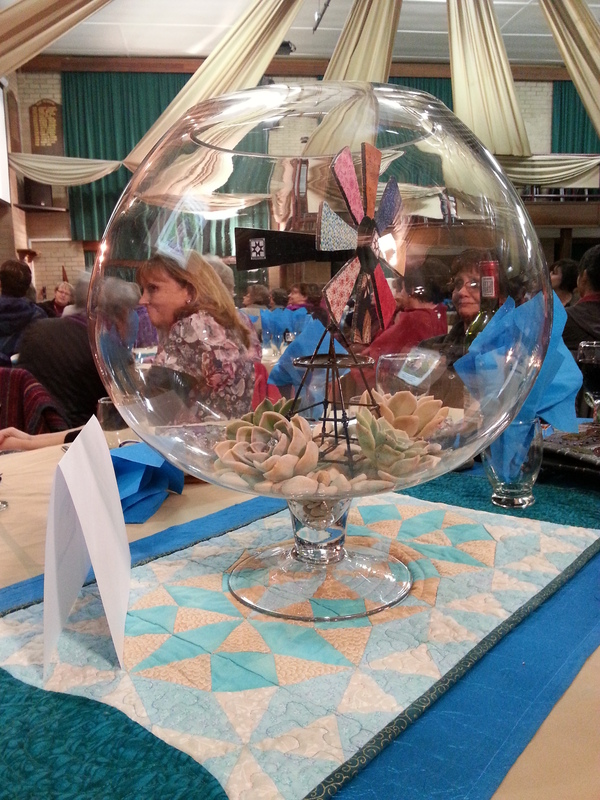 At every dinner table there was a lovely center piece continuing this windmill/Kaleidoscope theme. The large glass contained a windmill with rocks and succulent plants, and stood on a Kaleidoscope quilt table runner. 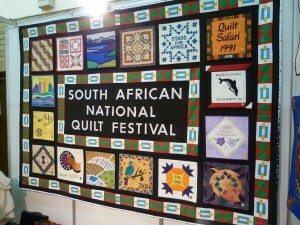 This area is very Afrikaans and for many of the Quilt Festival Committee, Afrikaans was their first language. Iessie Steenberg, the Chairlady, joked about her difficulty with English, but she was actually very proficient. 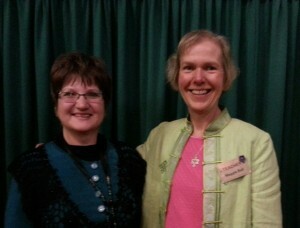 Much to my embarrassment, she announced to the assembled masses that all the proceedings were in English for my benefit! At the closing farewell, she was quite emotional when thanking her Committee and quipped, “I can cry in English!” Here I am with Iessie, who looked after us so well and we all loved her. I told her, “I can laugh in Afrikaans!”.